What parts need to be new? I assume all rubbers but are new washers and bolts a good idea? The short rod not shown is what actually fell off at some point so I know I will need to replace that. Also...does any one have a list of new parts needed to do a TB change properly? Are there certain bolts that need replacing just on the safe side? How difficult is it to change front seals while I'm in there? The car has 160000 miles. Any other services anyone can suggest while I have the front off? This is my first time in one....came apart very easily...no seized bolts. Last edited by Dean_Fuller; 04-16-2010 at 04:22 AM. Just change the rubber parts (boot and I think an o-ring). Disassemble the discs (keep them all facing the original direction) and clean/degrease them. Re-assemble and install it back on the engine with a new gasket. Fill with oil and your ready to install the belt and tension it. any other suggestions while I'm in there??? Common problem areas that need special attention? What Jim said, and use a good sealant on the gasket, common leak area. As that is what it does when the engine heats up and expands. Well Guys, take a harder look at that tensioner ..... it is an early 16v edition , so it has no lower piston, no O-ring, has no block gasket, nor does it have bleed orfices for oil filling. Clean and reassemble the belville washers in opposing stacks of 5 ( ie. 5 nested in the same direction like saucers in the cupboard ), fill the body ~1/3 full of oil ( 75W-90 is good for these tensioners, but motor oil also does the job). Then, drop the guts in, fit and clamp a new rubber boot on the top end, and reinstall. The boot may be difficult to find for the old version .... so talk to the 928 vendors here. 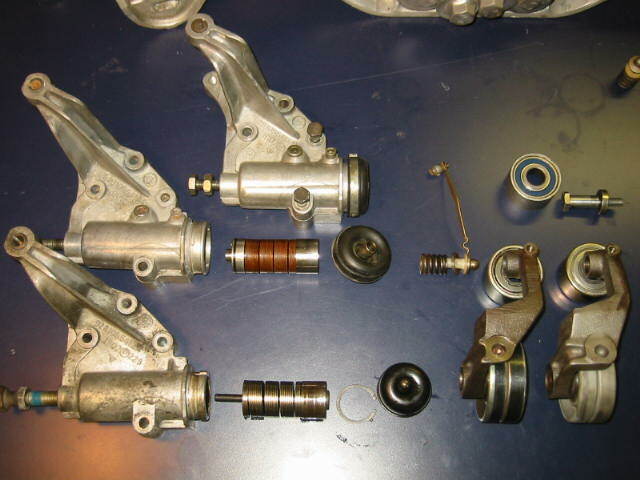 Here's an old pic of the tensioner differences - the early 16v is the lower left. +1 what he said above. I just did mine, the early tensioner is dead simple. There's not much to do but clean the parts and re-fill it with oil. You do need snap ring pliers to get the piston out. The boot there days (in my case anyway) came with an extra rubber ring because the later tensioner boot has too big a diameter for the early cylinder. You just slip the ring over the end of the cylinder to make up the larger inside diameter of the newer boot. Try to save the clamp if its not a crimp ring. I had trouble finding a hose clamp that was both long enough and narrow enough to work. Your standard hose clamp for that diameter is too wide, and has a tendency to slide off (along with the rubber boot) when you tighten it down. I used 2 smaller-width hose clamps to make one larger one. Had to carefully position it to not interfere. The Bellville washers need to be sequenced. Front main seal can easily be replaced. Same with Oil pump o-ring. Don't forget oil pump bolt o-rings (3, I think). Buy a set of replacement bolts when you buy water pump. Be prepared for breaking bolts and drill/helicoil. Not uncommon. Use anti-seize compound. Torque all VERY lightly and evenly, especially the bolt with the unusually large head. All TB tensioners must be properly functional, rolling well, else replace them as units, or bearings only as you see fit. Check gears to ensure teeth are flat and not dished. If oil leaks are happening near front of cam towers but you can't pinpoint source......Take off cam gears and cam tower "mickey mouse ears". There are several obscure but important O-rings on each side. They seal around camshaft end, also, small ones seal distributor oilway and mickey mouse ear to head. Reassemble this section using motor assembly lube, especially camshaft orings. If in this deep, a fresh distributor shaft seal is adviseable, simple. Don't damage in any way the "green wire" if so-equipped. Is that what you mean? There are a lot of write-ups to scan for this particular stuff. I would just like to say that this board already has an 82 with a Miles avatar. Many thanks to each....its a learning experience for sure but nice to have a place where someone like myself can ask knowledgeable owners....just wish a couple of you lived across the street. I just joined and am new to 928's and this site is a life saver for a DIY guy like myself. Am I to assume unless a bolt looks bad they are good to go? hey Bob...there can never be too much love for Miles. I like your taste in cars and music. Thanks Chris...I will take you advise with the extra parts. P.S...As you well know. It is a requirement HERE that you pull for the VOLS or you escorted to the state line and asked not to return....really. Or...you could chuck the whole mess, including the idler pulley(s), and not have to open the covers again for another 45K (or more with a US 16V). Tell me more please...what do you have? Maybe call 928's R US, Roger Tyson, he probably can fill you in. Or search Porkensioner. buy the Porken tensioner and have peace of mind for a longtime. The old boot is not available. To save people a bunch of money and time, we made up some aluminum spacers that epoxy onto the end of the tensioner. This allows the use of the later boot and tensioner pin that goes through the boot. You can get this stuff from 928 International. It's a cool little kit. Ask Mark about the early tensioner update kit from Precision. I think he sells the complete kit for $90.00. We've used literally dozens of these kits, over the years, and they work perfectly.